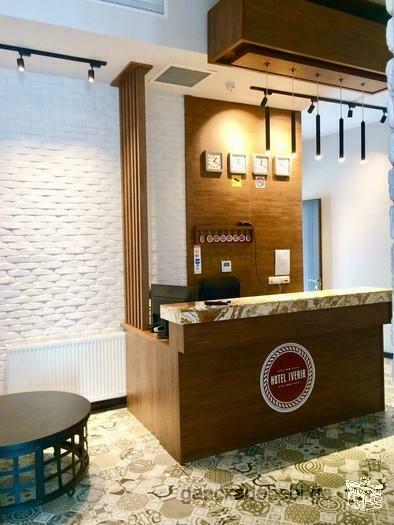 Hotel IVERIA is located in the center of Batumi, 5 minutes from the beach, and the boulevard! 2 minutes to Piazza, many historical and entertainment places. Central Market-5 minutes, Botanical Garden-12-15 minutes by car, dolphinarium, circus, cable car . everything is nearby! A cozy place for your holiday! numbers from 50-60-70-80 GEL. The area of ​​the old city in Batumi was built up in the XIX century, but now it is completely restored. It is the cultural and historical center of Batumi. Wandering the narrow streets of old Batumi, you feel like in Europe: the houses are like a doll, many flowers in the flower beds and cleanliness! In this area the Old Boulevard begins. Here is the cleanest sea. Oh! There are so many interesting and beautiful things here. Who will visit here, will fall in love with Batumi! The largest number of restaurants, bars, casinos and entertainment are also here! The land is suitable for a summer cottage. Away from the city and a nice quiet place. This is the place where you can really relax with your family.For stakeholders number 995555166574. Price Upon Request. Hello! I am looking for a job in a restaurant - a waiter. I'm 22 years old, punctual, work experience 4 years. I know 3 languages. I perform plumbing works of any complexity. Installation / dismantling of water supply, sewerage, tanks, boilers, uninterrupted water supply, sanitary ware and more. I sell hendmade church with its table and light,beatiful decoration. Rent newly renovated 2 bedroom apartment with all the necessary conditions. I cook delicious homemade dumplings from fresh meat. I guarantee quality. I am new to the place and i am looking for a job to start with. Nice and cozy apartment in Tbilisi, that will let you feel the real spirit of the city. Close to all main places of interest. Rented on daily basis. Shampoo, soap, shower gel, towels, disposable slippers, cleaning, personal administrator are provided.